Stats SA has released an in-depth report on persons with disabilities. The report, written using Census 2011 data, is the first in a series of in-depth analyses of various Census 2011 variables, such as ageing and education. Both measures aim at providing an understanding of the characteristics of persons with disabilities. 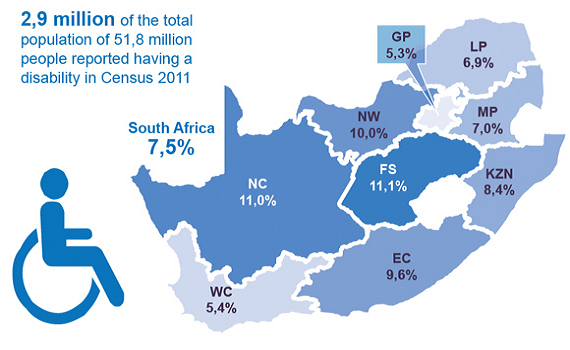 The national disability prevalence rate is 7,5% in South Africa. Disability is more prevalent among females compared to males (8,3% and 6,5% respectively). Persons with disabilities increase with age. More than half (53,2%) of persons aged 85+ reported having a disability. The prevalence of a specific type of disability shows that 11% of persons aged five years and older had seeing difficulties, 4,2% had cognitive difficulties (remembering/concentrating), 3,6% had hearing difficulties, and about 2% had communication, self-care and walking difficulties. Households headed by persons with disabilities were found to have less access to basic services compared to households headed by persons without disabilities. There were also disparities in terms of access to assistive devices across population groups and geography.